CentraXX Bio – Sample documentation often remains a static snapshot that concentrates solely on the time of collection. The CentraXX research portal, on the other hand, provides all relevant data continuously and links them in a meaningful and clear manner. In this way, new contexts of meaning are made recognizable and usable in research. CentraXX not only handles the structured storage and management of all sample data, but also establishes the content-related, longitudinal connection between these samples and all existing patient data, which originate from a wide variety of sources. The sum of all available data results in a multidimensional picture. Pseudonymized access also enables the recording of information and concrete findings while offering full data and patient protection. Biobanking for personalised medicine does not just begin with the actual laboratory activity, but can be divided into five phases. The first phase begins at the time of patient admission, during which important tools such as the Consent Management come into operation in CentraXX. This (extended) declaration of consent is the legal prerequisite for the use of samples and data for successful research. 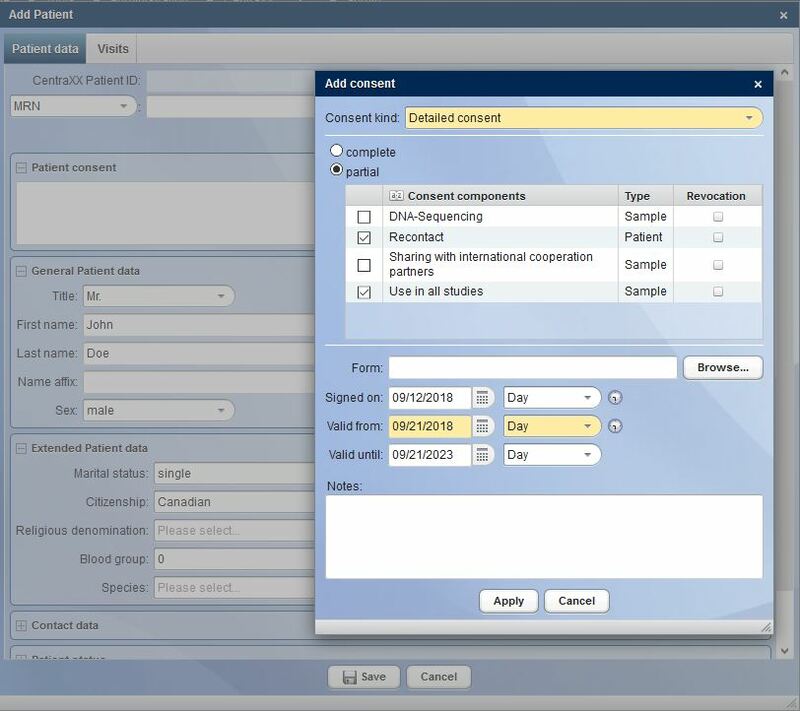 CentraXX can record a wide variety of patient-related and structured consents. Digital signatures or digital pen applications facilitate this process. The signed consents are stored in the CentraXX research archive as a digital document and can be called up by authorized users to be viewed at any time. During patient admission, all relevant patient data (e.g. master, diagnosis, therapy, and study data) are imported directly into CentraXX from the system that manages the patient (e.g. HIS). Alternatively, CentraXX also offers user-friendly masks for the manual recording of patient data for “stand-alone operations”. The biomaterial removed must be stored and documented according to certain minimum requirements, such as SPREC. CentraXX helps here with the corresponding integrated catalogues. 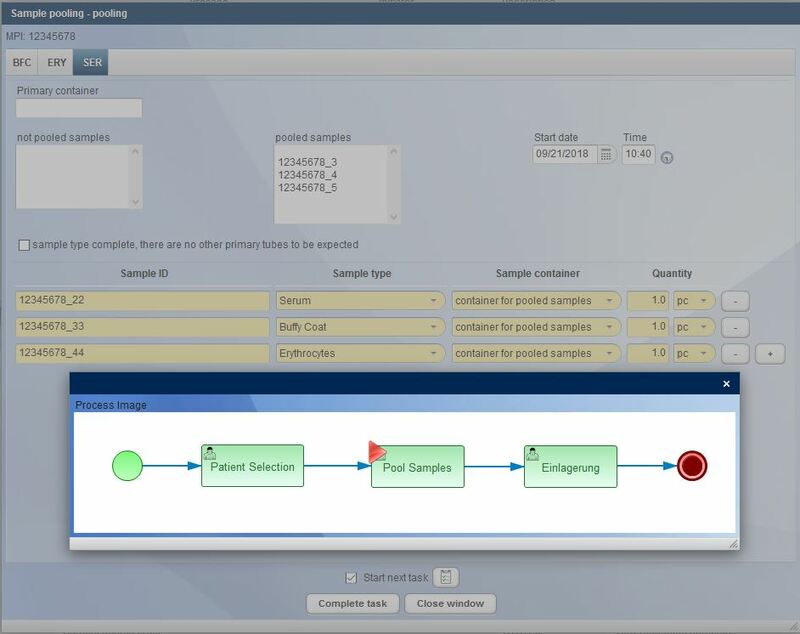 Since each laboratory within an organization works with its own Standard Operating Procedures (SOP), CentraXX uses a workflow engine. 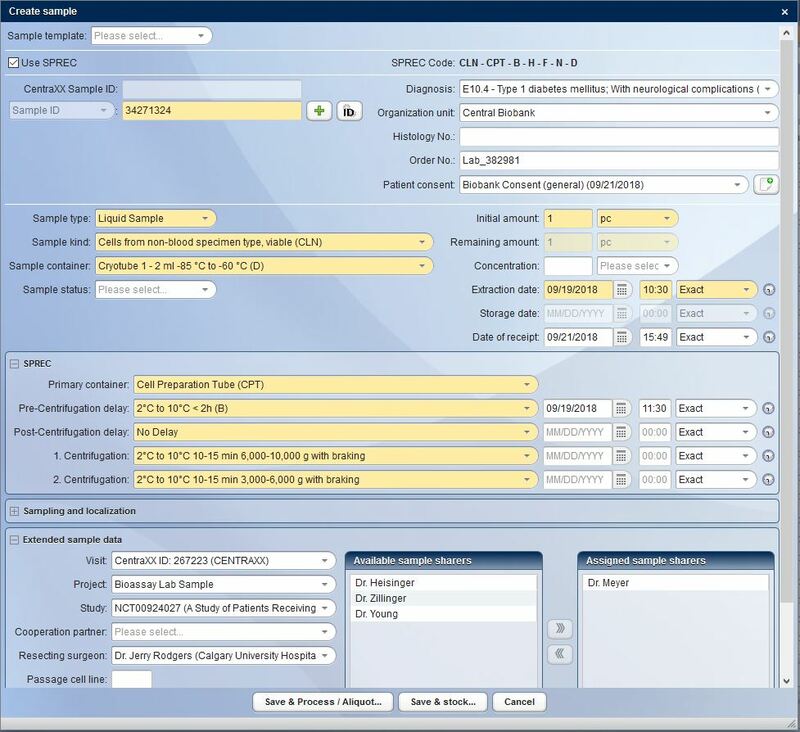 This enables the creation of rule-based, costumizable data entry screens in defined processes. The SOPs are not only displayed in CentraXX as pure blueprints, but also as IT-controlled workflows. This is always transparent in the display and in the task lists derived from it. Nowadays, operating a biobank is no longer about documenting individual samples, but rather entire sets of samples. CentraXX offers interfaces to barcode scanners and automatic aliquots to ensure high throughput operation. The entire life cycle of the sample is recorded, documented and clearly visualized in the system. All results obtained in a wide variety of measurement procedures in a broad range of systems are automatically fed back into the patient’s/subject’s personal record via the measurement profiles in the form editor. Beyond the pure collection of data, CentraXX enables all essential ad-hoc queries and maintains inventory lists independently through the use of the Report Engine. For example, it is possible to display the entire sample stock of the biobank, to display statistical evaluations of all recorded data or to export them to the most common statistical programs at any time. Beyond the most common export options, finished CentraXX reports can be sent automatically and at defined intervals to various recipients. In practice, one of the most important functions but also the biggest challenge of a biobank is the controlled publication of biosamples and their data. CentraXX offers the operators of a biobank a controlled and secure administration and publication of the entire sample stock. After successful registration in this system, the researcher can now independently create a list of suitable samples in the system and apply for their release at any time. CentraXX Bio consistantly provides important information as to whether sample material is available and where. In CentraXX Bio, it does not matter whether the storage structure is centralized or decentralized. The rights and roles management system ensures that the user only has access to those samples that may be issued to them. The operator of the Biobank always reserves the right of veto for the release of each individual sample; the researcher is likewise always informed about the current status of his/her request by using a ticket system. The researcher, for his part, can decide whether or not to return data to CentraXX, for example for test processing or found results. The decision whether this is actually done within the framework of the disclosure of his/her research and/or taking into account the patient’s/subject’s consent remains his/her own. Detailed information about CentraXX Bio can be found on the Product Sheet.